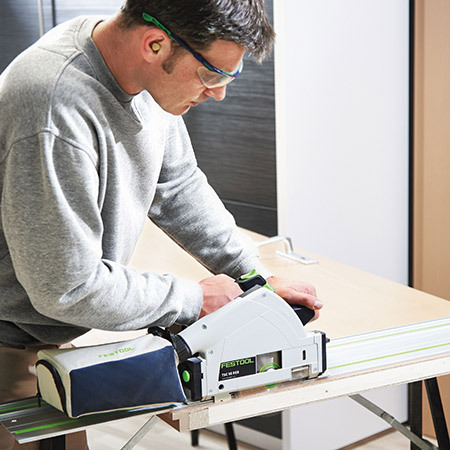 The Festool TSC 55 - their most popular plunge saw - is now available in a cordless version. 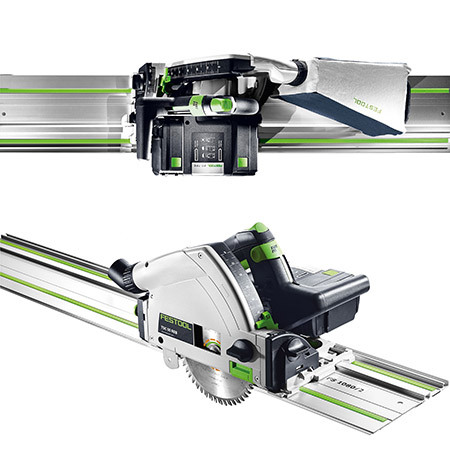 With its new brushless EC-TEC motor, and combined with Lithium-Ion battery technology, the Festool TSC 55 circular saw gives you maximum cutting power with the freedom of cordless technology. The unique flexible dual-battery concept allows for two 18-volt battery packs (36V) to deliver maximum power, or one 18-volt battery pack for low weight. With both batteries it operates at the same cutting speed as its corded big brother. And just like the corded version, the cordless unit cuts to a depth of up to 55mm, allows for cutting interior doors to length using a guide rail, can perform cutting recesses in doors and kitchen worktops, plus manufacturing expansion joints in parquet flooring and false joints along with cutting chipboard and any boards to size. The cordless model comes with a fine tooth saw blade HW W48, a splinter guard, flag window vision panel, chip collection bag and an operation tool. All Festool cordless saw sets come with 2 battery packs, a charger all packed in a unique Festool SYSTAINER SYS 5 T-LOC carry case. All Festool power tools are designed for fittings to be attached to any of their comprehensive range of Festool Dust Extractors. Plus, all tool sets come with their state of the art systainers a 1+2 year guarantee. For more information about the unique Festool brand and its huge range contact Vermont Sales on 011 314 7711 or visit their web site www.vermontsales.co.za. Festool is available from leading outlet countrywide.